The Romanised rulers of 'Palaestina' took this 'being a Roma' lark very seriously indeed. Palaces, temples, coinage followed Roman fashions and a whole new sea-port was built at Caesarea Maritima (Caesar-on-Sea?). The very best Roman architect, Vetruvius, was contracted to design it, and Herod had a palace built on the headland complete with Olympic-sized swimming pool. Excavations at Capernaum on Lake Tiberias / Kinneret have uncovered a site of great significance to Christians, a house that may well have been 'Peter's House' and the oldest known place of Christian worship in the world. 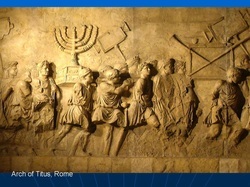 After 70 AD the Jewish community paid a high price for rebellion and the Romans went about expunging all trace of Jewish identity in and around Jerusalem. The Jewish diaspora dates from this time. Christians followed and the travels of early saints such as Peter and Paul illustrate the trade routes of the day.